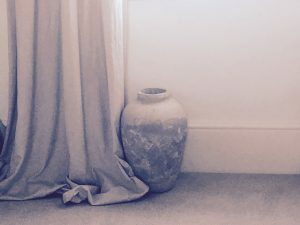 This is my post on rental decorating ideas. If you can’t see the video, please click here. I’ve just counted up and realised I’ve actually lived in 20 rental properties during my adult life. In fact, when I was renting in London I moved 12 times in 8 years. But I still wanted every place to feel like home. It’s not always easy though when you can’t paint the walls and you know you could be moving on within six months, so it’s not worth splashing the cash. With this in mind, I thought I’d give you some cost-effective rental decorating ideas that won’t get you into trouble with your landlord. Now, if it’s a lounge or a bedroom then cushions are your friend. The more vibrant and colourful, the better. Suddenly you have that injection of colour you’re after and of course you can take them with you. 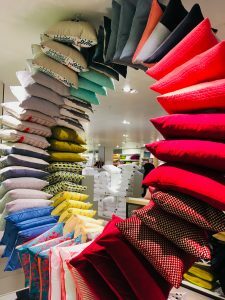 It’s very easy to shop around for cushions, but you can also simply make them yourself – even out of old clothes! You do need colour at different levels though. Don’t worry if you’re not allowed to paint your walls as there are many other ways of achieving this. For example, this mirror has been a bit of a chameleon. It started off silver, then I needed it to be white, followed by gold and now it has the addition of turquoise to go with my lounge. 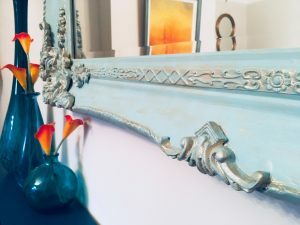 If you don’t already have a mirror, you can pick them up for next-to-nothing from a second-hand or charity shop and paint them. Here’s my guide. If you have artwork, but the frame is a bit bleurgh, there’s no need to go to the expense of reframing, just paint it! This is a great way to fill a big chunk of wall space with colour. Curtains also have a substantial impact on the look and feel of a room. 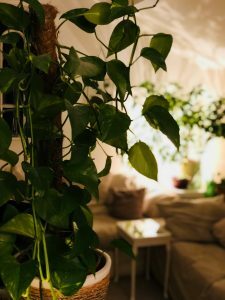 Get extra long ones that puddle on the floor, as not only will they look luxurious, but they are more likely to fit in multiple houses or flats. If making them yourself, it’s worth keeping extra fabric in case you need to add to the width in the future. If you already have shelves in place, here are some ideas of how you could dress them. When you move in somewhere, lighting is the easiest and quickest way to add character and comfort to a room. So it’s worth investing in a couple of decent lamps you’re going to be able to take with you. Make sure they’re a little bit quirky and unusual – you want them to be conversation starters. 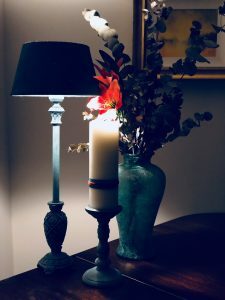 This one I bought from a charity shop and painted both the lamp and the shade. I love that it not only fits perfectly with the room but is also a one-off. There are so many cool standard lamps these days, so you can make a real statement with these. For maximum impact go for a real show stopper. A vibrant colour is a great start. If you have a classic base you can just change the shade with each new home at little expense. I have lived in many a rental property with brown swirly carpets. Frankly they gave me an instant headache! Now I certainly wasn’t going to fund recarpeting myself, just to increase the rental value for the landlord! However, did you know that if you choose a carpet from a local store and give the measurements you need, they will add whipping for a small price so you can use it as a room-size rug? This way you can cover the swirls with carpet of your choice, but take it with you when you leave. If it’s too large for the next place you can have it cut down to size. It usually ends up much more cost and time effective than hunting for the right rug. You also have a lot more choice available. Although the following is one of my rental decorating ideas, it’s also relevant if you’re staying somewhere temporarily for some reason. Or it may be that you know your kids are going to change their minds in a couple of months as to where they want things on their walls. You don’t want to be using nails or screws so a great solution is this ‘Damage-free Hanging‘ range I was sent by Command. These clever gizmos work like velcro. So you have one sticky side that goes on the wall. You then have a spacer that goes in between. Then there’s a sticky side that goes on the item that you’re actually hanging, and it all meshes together. With the larger ones you can actually hang up to 7.2kg, which I think is incredible. Once you’re done with it, or you’re moving, you can pull it away and it doesn’t damage the wall. The only point to remember is that you mustn’t use it on wallpaper, but it’s still a great solution. I always feel like a room isn’t finished until it has at least one plant. If, like me, you’re not very green fingered though you need to know which ones are easy to look after. Also if you move a lot, they need to be pretty hardy. Devil’s Ivy has always been a winner for me and it just grows and grows and grows. The great thing about it is because you can drape it around archways and other areas you can get a really dramatic effect. The Peace Lily is probably one of the easiest plants to look after. I’ve actually had one since my student days – which is a long time!!! 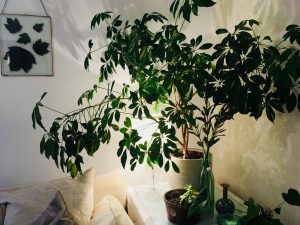 I’ve had a lot of success with an Umbrella Plant I inherited from my mum when she moved. It seems to need next to no attention but grows well to create a big effect. It’s worth experimenting with what works in different kinds of light. One of my plants has clearly not been happy. Particularly when I was practising filming and my daughter Bonnie decided it was play time! Don’t forget you can go faux with your plants for very low maintenance as there are so many realistic ranges out there. You do tend to get what you pay for with these though so it’s worth investing a little more. Of course I haven’t mentioned furniture in the rental decorating ideas above. If your place is furnished you are kind of stuck with what you’re given, but throws can be your friend to hide unsightly pieces. If you are providing your own, and only have a small budget, check out some of my guides on upcycling. 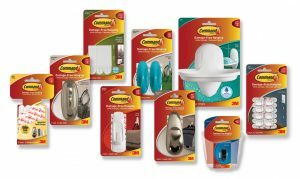 This way you can kit out your crib the way you want for less. Once you’ve upcycled a piece, you know you can do it again in the future if and when your taste, colour scheme or rental place changes. The above is assuming that the landlord will not allow you to leave your mark on the property. 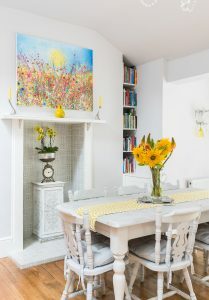 If you’re planning to stay somewhere for a decent length of time though it’s worth having a chat with the owner about your rental decorating ideas. Landlords want long-term tenants who take pride in their homes. They may be happy to give it a lick of paint or recarpet it for you if they feel it’s going to keep you there for longer. 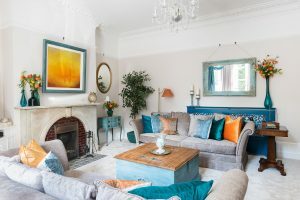 I would love to hear your response to my rental decorating ideas, and any relevant stories or even further advice you may have, so please do leave comments. 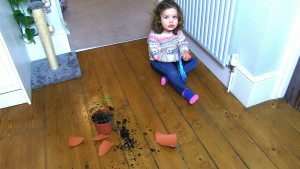 Ha – the plant was not too bad actually, but the pot…. If you paint a shade, you generally need to water down the chalk paint – will probably do a post on it soon.